The Millstone quilt block was new to me. I quite enjoyed seeing the possibilities with colour. This block is comprised of lots of different elements -- squares, half square triangle pieces, quarter square triangles and flying geese. For the reason that there are so many bias edges, I have added this quilt block to the intermediate category, although there is really nothing difficult to making the block. 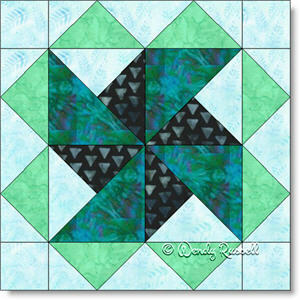 By taking care with your piecing and those pesky bias edges, this block will be a very welcome addition to any quilt. Just as colour plays an important part in the making of the quilt block, it is also the case when choosing the final components to finish off the quilt. This is evident when you look at the sample quilts displayed here.